R. Murray Schafer: a Canadian music teacher who worked in the 1960’s. He noticed that children had almost no awareness of sound because they were so used to ignoring their surroundings in favor of the visual. He created a series of exercises to teach children to listen to commonplace sounds. Karlheinz Stockhausen: a German composer from Cologne who created pure electronic music using sine tones- the actual atomic structure of sound, in the 1940s. Pierre Schaefer: A radio engineer working in Paris in the late 40’s who invented sounds never heard before. There are countless practicing sound and installation artists living and working today- but by focusing on the founders of the movement as we know it today, we can put most sound and installation art in a historical context that makes it easy to appreciate. Zimoun, an artist living and working out of Bern, Switzerland, is a very good example of how modern sound art has developed; his work is a complete departure from music. He most frequently works with materials like cardboard and plastic to imitate sounds from our surroundings or creating something completely new. In his piece using 329 prepared dc motors, cotton balls, and a toluene tank, the materials are used to imitate the sound of rain. He has taken inspiration and channels both artists associated with the Dada movement, such as Marcel Duchamp, and John Cage, whose work he studied and admired often in his early studies. This is evident in his work, which combines both found object and found sound- creating installations that are cross-displinary, very similar to early sound art that explored music, art, and dance. Christian Marclay is another artist who worked with sound in his famous piece Guitar Drag. By using a guitar, he creates sounds that have the timbre of a rock song, while having almost no connection to music at all besides the fact that it is an instrument. It was also inspired by the works of John Cage because of the element of unpredictability that is in most of his works. Marcy also placed a commonplace instrument in a new context. “Soundscape” is a term that is now used quite often in association with sound art, and which most modern sound artists identify their work with. Soundscapes focus on an artist’s surroundings- this means that now it is more common to create these pieces in installation form- much different from the small objects and prepared instruments of 50-100 years ago. Cage is an example of an artist who rejected the idea of different art forms being separate from each other. He once said, “When I hear what we call music, it seems to me that someone is talking. And talking about his feelings, or about his ideas of relationships. But when I hear traffic, the sound of traffic—here on Sixth Avenue, for instance—I don’t have the feeling that anyone is talking. I have the feeling that sound is acting. And I love the activity of sound […] I don’t need sound to talk to me.” which is a perfect representation of the mentality of the Fluxus movement, and the subtle differences in sound art and music: one has a clear message as a result, the other has value in the act of producing the sound. John Cage was one of the most prolific composers of the second half of the 20th century- he was deeply rooted in tradition but interpreted it in an abstract way. He believed that the use of noise to make music would only increase- in his piece 4’33”, the silence forces the listener to not only take notice of the absence of sound, but also the noise that they usually overlook (breathing, movement). His compositions often used outside influence and chance to determine the relationships between sounds. For example, the I Ching is a Chinese method of divination that Cage sometimes used to create his works. Fluxus was an anti- art movement of the 1960’s that explored ways of creating art that were not the norm at the time. Like Dadaism, intermedia works were common; most work was interdisciplinary and bridged the gap between different forms and media. This was the first time that performance art really evolved, and the Fluxus movement was heavily influenced by artists such as Marcel Duchamp and later John Cage. It embraced the avant garde, concepts such as random music, ready made, and conceptual art. The manifesto set out to rid the world of commercialism and pseudo intelligence. Yoko Ono was a prevalent member of Fluxus, both as a musician and a performance artist- again showing that the movement bridged the gap between disciplines and media. As this article says, sound art is a relatively new term- it became common only in the 90’s, but sound art had existed long before then. Before “Sound Art” became a common term, sound artists were considered experimental musicians. Any work not made with the widely accepted instruments or methods was considered experimental- and that is what sound art has evolved into today- it has become more of a departure from music and is now established and can be considered completely separate from music, although it might be an influence. In the 1920’s, Dadaist and Surrealist artists collaborated with musicians such as Erik Satie and Les Six to create Sound Art for the first time. This branched off into areas of art such as spoken word poetry and different forms of experimental music. Kurt Schwitters was one artist who experimented with sound poetry, which can be described as verse without words. This kind of poetry is solely intended for performance. During this time, artists made work that was very interdisciplinary- such as Francis Picabia and Georges Ribemont-Dessaignes. Dessaignes regularly contributed to Littérature, a periodical that was a collaboration between many Dadaist artists. In this period, sound art was mainly comprised of experimental sounds inspired by machinery. One important figure during this time period was Francesco Balilla Patella, who wrote Manifest of Futurist Musicians. He was an advocate of Avant-Garde music and encouraged young artists to stay away from conservatories and learn independently. Another early example was George Antheil, who wrote “Airplane Sonata, Death of the Machines, Ballet Méchanique” (he was the first to synchronize artificial sound with human performers). 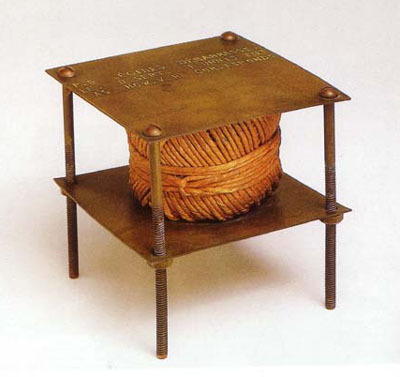 Marcel Duchamp created “A Bruit Secret” (With Hidden Noise), a noise instrument that was created in collaboration with Walter Arensburg. “Before I finished it Arensberg put something inside the ball of twine, and never told me what it was, and I didn’t want to know. It was a sort of secret between us, and it makes noise, so we called this a Ready-made with a hidden noise. Listen to it. I don’t know; I will never know whether it is a diamond or a coin” (Sanouillet & Peterson 135). The piece rattles because Marcel Duchamp intructed Arensburg to place an object inside, but to no tell anyone what it was. 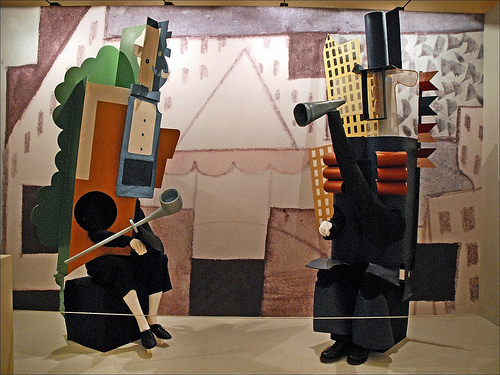 Found Sound was another form of noise art or sound art that emerged in the 20s- one example of this was “Parade”, a performance that was performed at the Chatelet theater and that was a collaboration between Jean Cocteau, Pablo Picasso, Leonid Massine, and Erik Satie. Cocteau called the sounds that they made a trompe l’oreille. The piece included sounds from a dynamo, Morse code machine, sirens, a steam engine, an airplane motor, factory sirens, and typewriters. This was one of the first pieces to recognize other sounds as able to produce something that could be considered art instead of just music. Although Satie is not considered a sound artist as much as an impressionist composer, pieces like his are important because of their relation to art from that time period. Sound art was born out of a combination of artists looking beyond traditional media and using technology that was starting to develop.